This series of blog posts will outline the steps taken to stand up a cybersecurity lab using Microsoft’s Hyper-V. This lab will be used for everything from running Kali LINUX penetration testing tools, offensive countermeasures and techniques using tools like Active Defense Harbinger Distribution, cyber forensics, and anything else that I may choose. 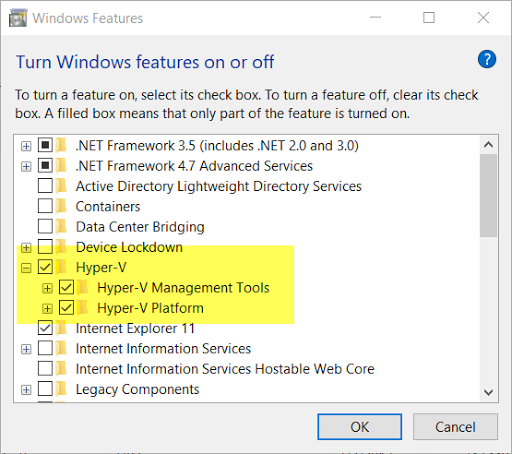 I will be using a hosted Hypervisor for the lab, Microsoft’s Client Hyper-V running on Windows 10 Professional. Anyway, enough is enough let’s get started! The first thing we have to do is to navigate to Control Panel -> All Control Panel Items -> Programs and Features. 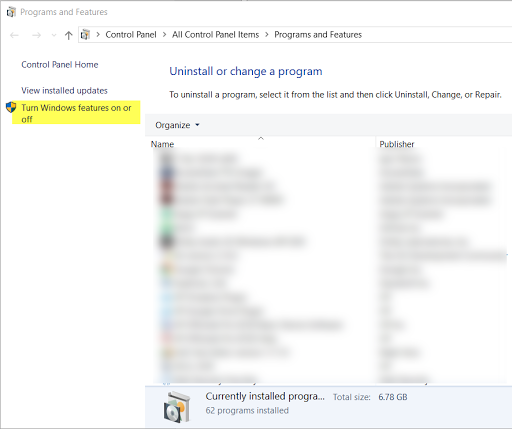 After Windows installs the Hyper-V feature you will need to reboot your host system. Once the host comes back up we will begin customizing some of the Hyper-V settings. The first setting that will be configured will be the Server settings. 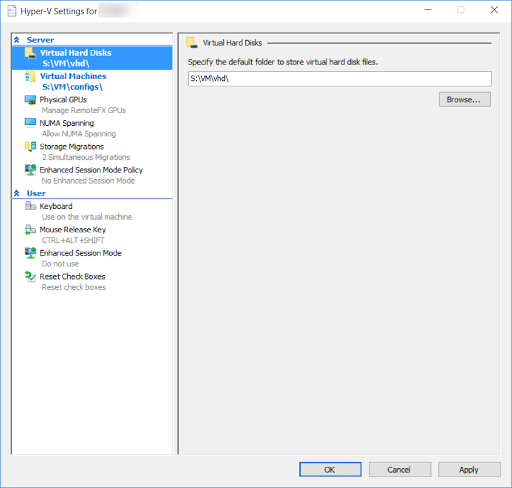 The server settings affect how the Hyper-V server functions. The first server setting that we will configure is Virtual Hard Disks (VHD). The VHD setting identifies where on our host system the vhd (or vhdx) files will be stored. After identifying where to store the vhd and vhx files we will do the same for Virtual Machines. 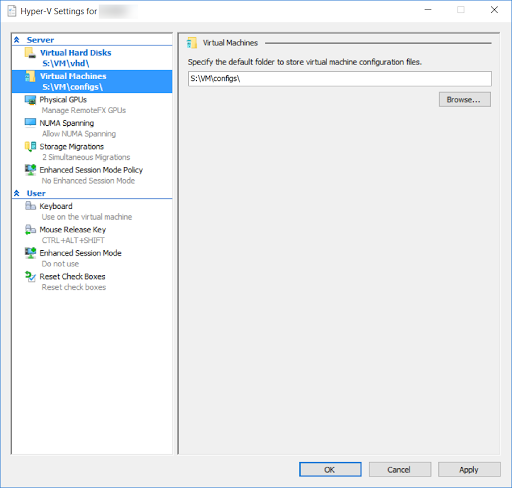 On the left pane select Virtual Machines. This setting specifies the default folder to store VM configuration files. Next is Physical GPUs. This setting determines whether or not VMs with have direct hardware access to any installed GPUs on our host system. This setting is not applicable to our environment so we will make sure that Use this GPU with RemoteFX is unchecked. 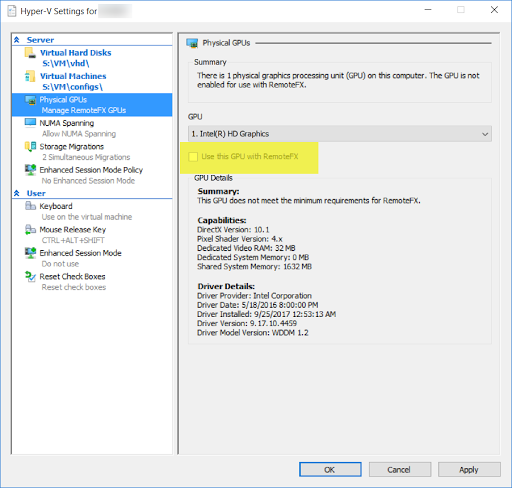 We will also leave the next setting, NUMA Spanning and Storage Migrations alone as it too is not applicable to our environment (if you want to know more about this setting you can read about it at https://technet.microsoft.com/en-us/library/dn282282(v=ws.11).aspx). We will also not be doing anything with the Storage Migrations setting as we really don’t have a need to move or migrate any VMs in our lab environment. 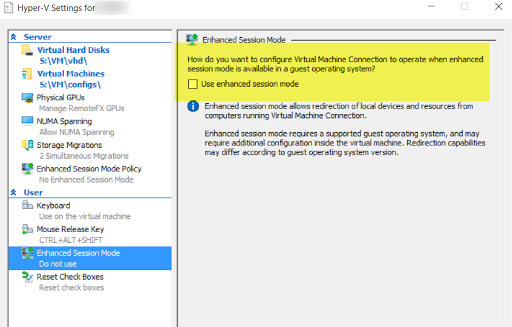 The final server setting, Enhanced Session Mode Policy, is one of the most import. 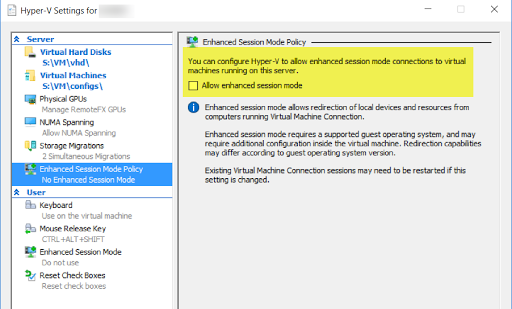 You can find out more about it HERE but in a nutshell, this setting provides functionality similar to the way RDP allows access to local resources and Enhanced Session Mode brings similar functionality using VMConnect. One needs to be very careful with this feature because this is where one can break segmentation and isolation between the VM host and the VMs in the lab setup. And since we will be using this lab for all sorts of nefarious things as a precaution we will NOT be enabling this feature. We can always enable it in the future should it be needed.